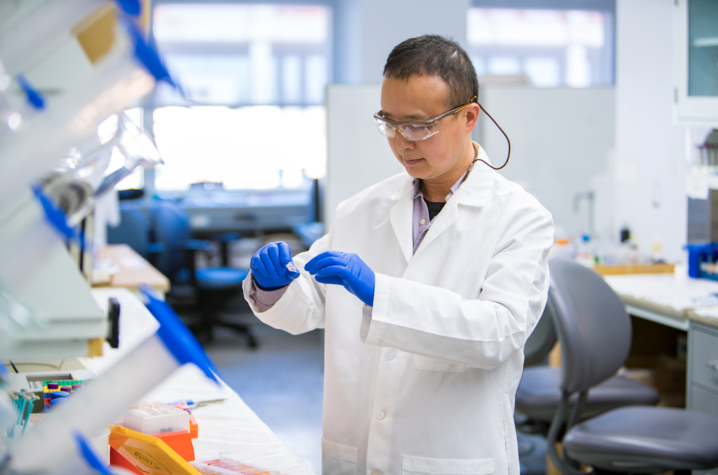 A new study conducted by the lab of Markey researcher Ren Xu suggests that targeting a protein known as collagen XIII could be key for suppressing breast cancer metastasis. LEXINGTON, Ky. (Oct. 8, 2018) – A new study by University of Kentucky Markey Cancer Center researchers suggests that targeting a protein known as collagen XIII could be key for suppressing breast cancer metastasis. Breast cancers begin in the epithelial cells, which are the cells that line organs and tissues in the body. Generally, most epithelial cells will die after detaching from their substrata, known as the extracellular matrix – this type of programmed cell death is called anoikis. However, metastatic cancer cells are resistant to anoikis, which allows them to circulate the body and begin growing in other organs. “Understanding how these cancer cells spread and colonize distant organs is crucial for identifying novel strategies to halt the cancer progression and improve cancer treatment,” said Markey researcher Ren Xu, associate professor in the UK College of Medicine’s Department of Pharmacology and Nutritional Sciences. Metastasis is the cause of 90 percent of breast cancer-related deaths. Though breast cancer is very treatable in its early stages, once the disease has advanced and spread to other areas of the body, it’s considered incurable. Currently, patients may undergo a wide range of therapies designed to shrink tumors, improve symptoms and increase life span with varying success. Developing therapies to target collagen XIII could be a potential new strategy to fight breast cancer metastasis.